Contact Fort Lauderdale Accident Lawyers Gerson & Schwartz, P.A. Suffering personal injuries puts you in a difficult situation. That includes accidents in Fort Lauderdale on the Brightline Trains and train station. Aside from the pain and stress, you need to deal with many injury-related expenses such as visits to the doctor and physical therapy. If you can't work while recovering, you are losing wages. All this could drain you financially, but if the accident happened due to the negligence or wrongful act of Brightline, then you may be entitled to be compensated. Brightline trains are responsible for accidents that occur at their stations or on their trains under the rules set by the Department of Transportation and Federal Railroad Administration and Florida negligence laws. Brightline has a legal duty to provide a reasonably safe environment for visitors and riders. When they breach this obligation due to negligence then accidents can happen, and people get injured. If responsible then Brightline may be legally responsible to pay for all damages including medical expenses, lost wages as well as pain and suffering. To determine if your case qualifies for damages recovery, call us at the Gerson & Schwartz. Our Fort Lauderdale Brightline train accident lawyers are available for free consultations at (954) 845-0535 or (305) 371-6000. We handle cases on a contingency basis, which means that you pay nothing until and only when we recover for you. Brightline is the first privately-operated train company in the US since 1983. It started operating on 13th of January in 2018 connecting Fort Lauderdale and West Palm Beach, before expanding to Miami on May 19th in 2018. For now, these are the three train stations they serve, but they plan expansion to Orlando and possibly other Florida cities in the future. Fort Lauderdale is the middle stop on a Brightline commute. 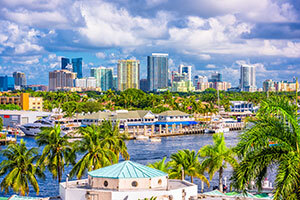 Located between West Palm Beach on north and Miami on the south, it is one of the major cities in Miami metropolitan area and the Fort Lauderdale Brightline station serves metropolitan Fort Lauderdale. In case of injuries sustained at Brightline trains and stations, you'll likely need a Fort Lauderdale injury lawyer to help you navigate through the legal process. Don't expect Brightline to simply hand you money and risk their reputation by admitting anything. They will likely not admit that the accident was their fault. You can challenge that denial with the help of Gerson & Schwartz. Our Fort Lauderdale Brightline train accident attorneys are available for free consultations at (305) 371-6000. We handle cases on a contingency basis, so you're not paying any fees until we recover for your Brightline accident and injuries.